functional limitations: The maximum transfer of 10 files for trial version. 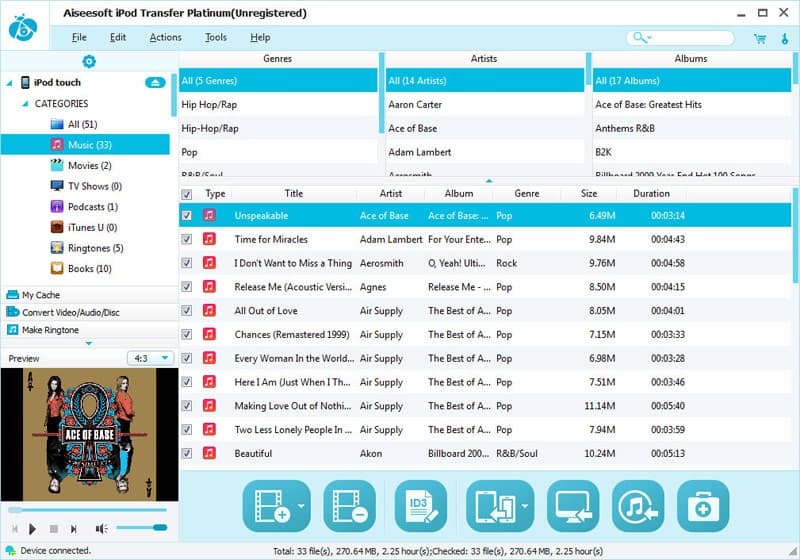 Aiseesoft iPod Transfer Platinum is the best tool for you to manage all your iPod files without losing anything. With it, you can backup all iPod files(music, movies, pictures, podcast, iTunes U, TV shows, books, camera roll, voice memos, and camera shot) to computer, and transfer music, movies, images, PDF, and ePub on computer to iPod. Also it allows you to rip any DVD disc and convert popular video/audio files to iPod supported video/audio formats, then import them to iPod or iTunes directly. Moreover, it highly supports The New iPad, iOS 6 and iPhone 5 now. You can connect multiple Apple devices to computer, and then transfer your files between these iOS devices(iPod, iPhone and iPad) directly. This transfer can help you trim your video to any time length, cut off unwanted playting areas of your video to fit different players, add video the image or text watermarks, even join different video files together. This iPod transfer can fix your device if the iTunes Database of iPod has been damaged. This iPod transferring software can help you add or edit the ID3 information of your iPod video/audio files. Highly compatible with all iPod/iPad/iPhone modles: iPod, iPod classic, iPod nano, iPod shuffle, iPod touch, iPhone, iPhone 3G, iPhone 3GS, iPhone 4, iPhone 4S, iPhone 5, iPad, iPad 2, and The New iPad. SVFlix Bank Transfer (Popularity: ) : This contribution is originally from Bank Transfer 1.4TK. I have added a tax zone drop down, order status drop down, added some language definitions and fixed up admin and catalog display for a smoother look. UK Direct Bank Transfer (Popularity: ) : This module is a simple drop in payment module to allow customers in the UK to do a direct bank transfer, the customer email and final checkout page contains details of you bank account.